Events — Karen McGratten, M. Div. Check out this free documentary screening happening Wed. Sept. 26th, 2018 at 6:30pm at the University of Guelph, in Peter Clark Hall (found in level 0 of the University Centre) put on by the Waterloo-Wellington Eating Disorders Coalition. Find more information on the Waterloo-Wellington Eating Disorders Coalition’s website or on their Facebook page. "Our goal is to showcase the voices of people who have lived experience of an eating disorder, or who have helped a loved one through a struggle. As eating disorders remain incredibly misunderstood throughout our society, and we hope to increase awareness and urgency in addressing the misconceptions. Eating disorders are not a choice, and they can affect all different types of people. We will have a wide range of performers from different genders, backgrounds, and ages, and showcase their art and their voices as a call for more prevention, awareness, and attention to the field of eating disorders. $10 or $5 at the door for students with valid ID"
Come and check out various events in Guelph during Eating Disorders Awareness Week. Wednesday Feb. 1st - Market Square will be lite up in purple to help raise awareness of eating disorders. Thursday Feb. 2nd, 7:30-9:30pm: voiCED - Comedy Bar . Various art forms will be shown and presented at this event as a way to raise awareness. wiTHIN will also be shown! Tuesday Feb. 7th, 10-3pm: Eating Disorders Exposé - University of Guelph (in the UC). Come and check out various organizations, both on and off campus, that have a passion for raising awareness and/or treating eating disorders. Thursday Feb. 9th, 7-10pm: Eating Disorders Benefit Concert - University of Guelph (in the Bullring). Check out music by Laura Menard and her band to help raise awareness of eating disorders! Check out NEDIC for more events in your area! Hope to see you there! Take a stroll in downtown Guelph to see signs in storefront windows promoting Health At Every Size, counteracting dieting and negative message around food, weight and body discrimination. 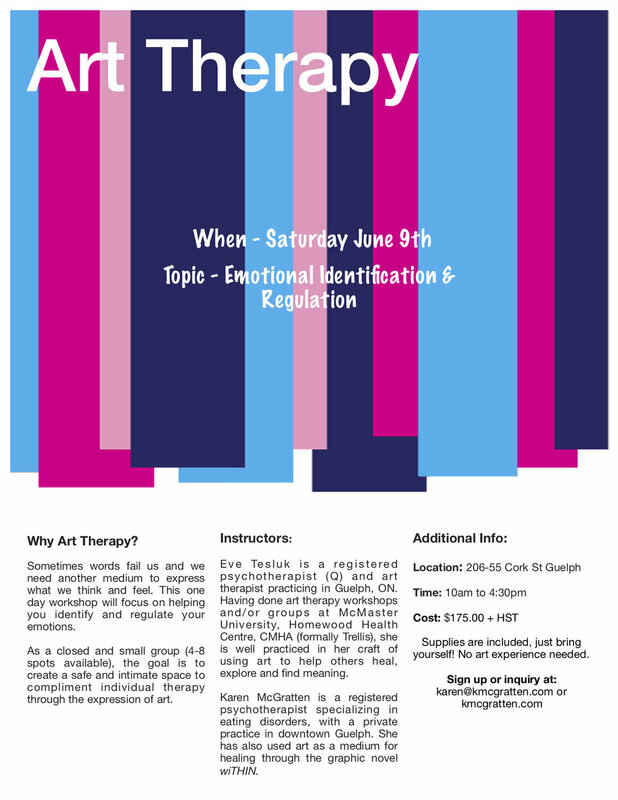 8 week art therapy group for clients struggling with an eating disorder. Come check out the interactive booths from various organizations (both on and off campus) that deal with eating disorder and body image issues. The event takes place on Wednesday Jan. 28, 2015 in the MacNaughton Building on campus at the University of Guelph from 11am-3pm. Emily McGratten (the illustrator of wiTHIN) will be with me showing off panels of our book.